NOTE: THIS IS AN UNFINISHED PRODUCT. I WILL BE DOING SOME MAJOR EDITING AND FORMATTING. AT THIS POINT, ANY COMMENTS ABOUT CONTENTS AND ANY ADDITIONS WOULD BE APPRECIATED. After repossessing KLYK from the Tafts and partner, D. Gene Williams brought KSPO back to life on 22 September 1964. The format was country and western music, a format the station kept until October 1975. This was the second iteration of KSPO. 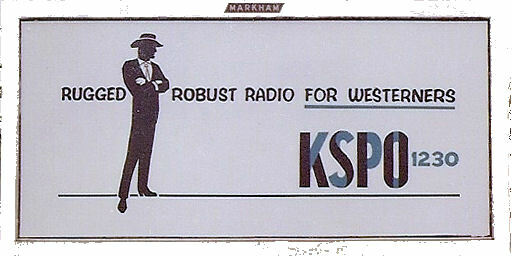 The first iteration of KSPO lasted from 9 June 1950 to 17 July 1957, and broadcast on 1340 kHz. Williams passed away on 24 December 1964 and the station went to Mr. Williams estate. Del Cody re-acquired KSPO in April 1965. According to the FCC records, their studios and remote control point were located at 55th and Regal from 22 September 1964 to April 1966. In September 1965, the station installed a new transmitter, an RCA BTA IRI and raised the daytime power to 1000 watts. The nighttime power stayed at 250 watts. KSPO moved their offices and studios to the BOF Building, 933 West Third Avenue in Downtown Spokane in April 1966. 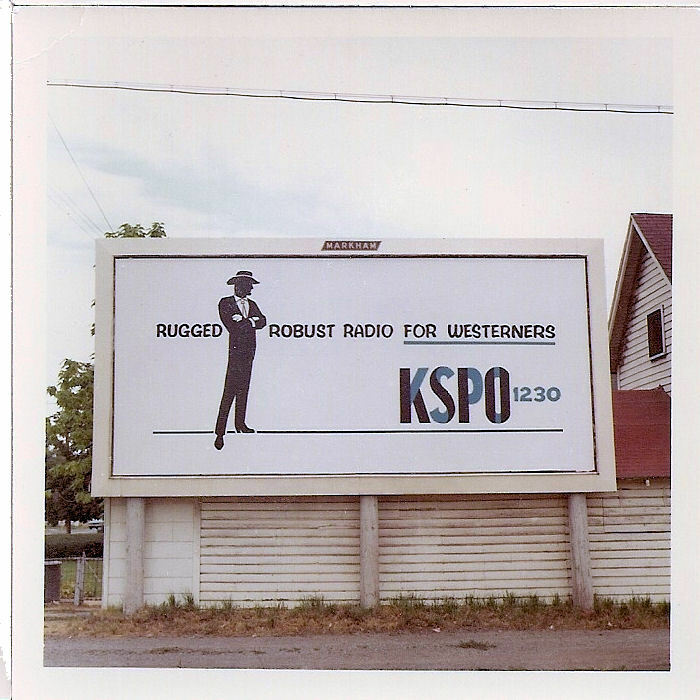 Bill Glenn recalls that the KSPO had a promotional campaign which featured an icon of a silhouette of a gentleman cowboy dressed in what appears to be a business suit. He was called the "Big Country Giant." Below are some comments by Bill Glenn who worked at KSPO from 1966 to 1967. 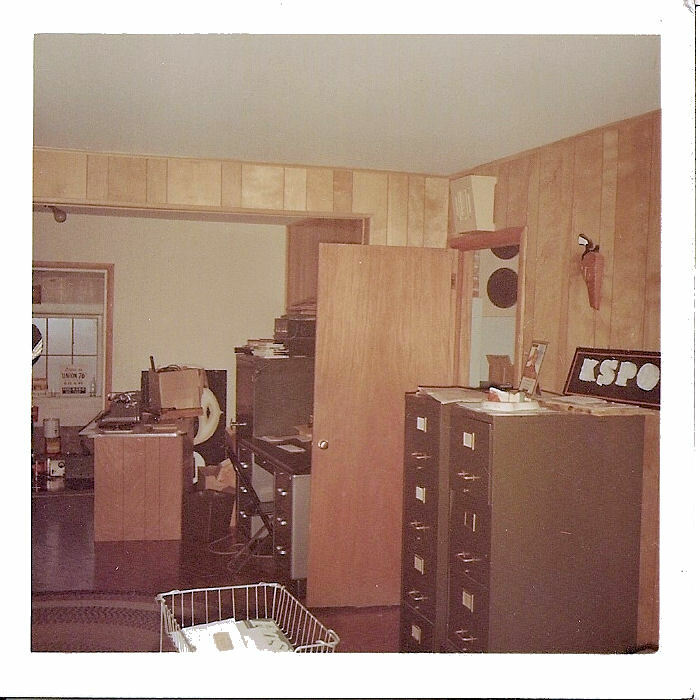 Here are the pictures I have of the KSPO studio in the old house. All 6 of these pictures were dated April of 1966. Someplace I have some of the promotional material that goes with the billboard. We started running that Westerner promotional campaign about the time we moved to the BOF. Building at 3rd and Monroe. We had a jingle package that was based on the music from the Movie 'Giant'. So, naturally we called the cowboy on the billboard the 'Big Country Giant'. At about that time, they started building the freeway through the southern part of downtown Spokane. I went right behind the BOF building. So, whenever the construction noise and rumble got so much you could hear and feel it in the studio, we would joke about it on the air and suggest that our Big Country Giant was stomping around the area making Spokane a better place. I should probably clarify on the time frames again, as I was kind of rambling when talking about that period....I went to work for KSPO in early January 1966 and we were in the house. My memory says late spring or early summer was when we moved to the BOF building. 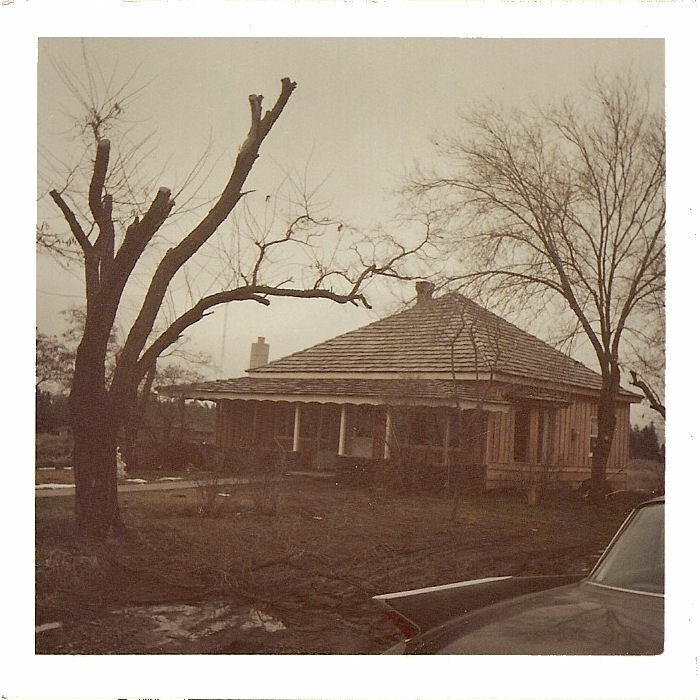 The pictures were dated April 1966 so we were probably still in the house at that time. The 'Big Country Giant' promotion started in late 1966 or early 1967, and was designed to enhance ratings, so it was probably wrapped around either the Winter or Spring ratings period. (about the same time construction started on the freeway) Speaking of ratings, it was around that time that KSPO pulled high enough ratings to knock off KHQ in the 12+ numbers for the first time ever. I moved up from part time to take over the midnight shift in March 1967, moving to the 6 - Midnight shift in May or June 1967 and then I left KSPO in late July or early August 1967. Other people names that come to mind from that period. Obviously Del Cody was the owner/manager. Engineering was done under contract by Ed Antosyn, who worked full time for KHQ. Sidelight... Pete Hicks was a Canadian citizen and couldn't sign logs, so the all night guy had to stay on shift until 8:00 AM and sign the logs until somebody else who could sign them came in to work. When I did the Midnights, we had to fudge a bit as I was due to work at Fairchild at 8. So, we cheated and I signed the log until 8 even though I left for the base at about 7:35 AM. Richard B. Wheeler bought KSPO from Del Cody on 22 January 1971 and took over operations on 1 March 1971. 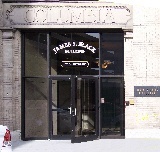 Wheeler noted that the quarters in the BOF building were "in extremely poor condition" and moved the station to 608 Columbia Building around November 1971. By 27 October 1971, Wheeler named Tom German as the station Technical Director. Robert L. Flynn was named general manager of KSPO in early February 1972. Flynn came to Spokane from Indianapolis, Indiana where he was the manager of radio station WATI. Rich Newman was named sales manager sometime later. Wheeler also hired someone for the new position of Public Affairs director, but the records do not reveal their name. Wheeler changed the station's format to all news in October 1975. This ended KSPO as a country and western station. Although I listened to stations such as KNEW/KJRB and KREM most of the time, I did listen to KSPO once in a while. I remember my parents and others listening to KSPO because they enjoyed country music. The problem was that out in our home in the Valley, it was difficult to pick them up at night due to interference and their relative weak signal. It is impossible to forget their jingle "K-S-P-O, One-Two-Three-O!" There was no doubt to which station you were listening. I collect radio recordings, and I still don't have one with KSPO's jingle. It is one of my most wanted recordings. I also remember the promotional campaign that Bill Glenn mentioned above, with the cool "gentleman cowboy icon. Exterior view of house at East 55th Avenue and South Regal Street which housed KSPO studios and offices. April 1966. 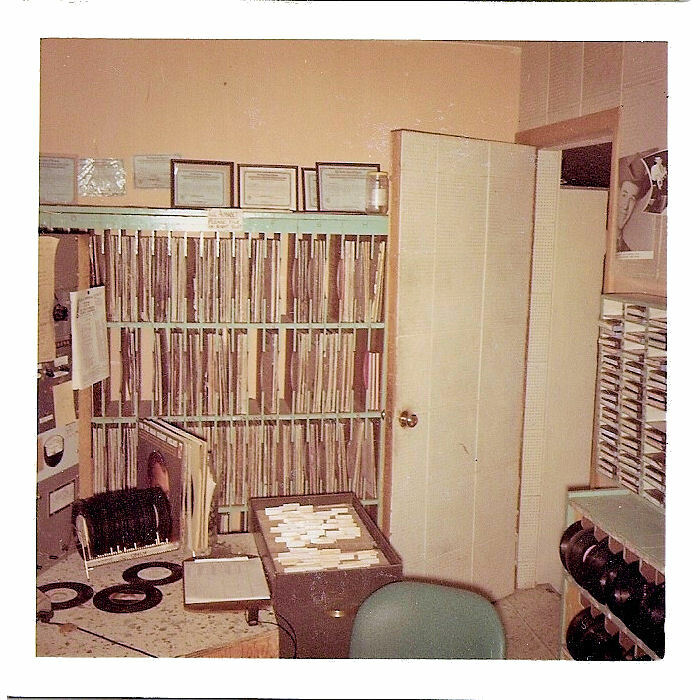 Interior view of house at East 55th Avenue and South Regal Street which housed KSPO studios and offices. April 1966. BOF (Brotherhood of Friends) Building 933 West Third Avenue, front view. Antosyn, Ed. Interview by Bill Harms. 28 August 2008. Glenn, Bill. Email correspondence with Bill Harms late-September 2008. KSPO, Application for Renewal of Broadcast Station License. Federal Communications Commission. Washington, DC. 11 November 1968. From National Archives, College Park, Maryland. KSPO, Application Record - Broadcasting. Federal Communications Commission. Record Number #21. Form BC-121. Washington, DC. Extracted by Xen Scott. KSPO, Application Record - Broadcasting. Federal Communications Commission. Record Number #22. Form BC-121. Washington, DC. Extracted by Xen Scott. KSPO, Application Record - Broadcasting. Federal Communications Commission. Record Number #24. Form BC-121. Washington, DC. Extracted by Xen Scott. KSPO, Application Record - Broadcasting. Federal Communications Commission. Record Number #25. Form BC-121. Washington, DC. Extracted by Xen Scott. KSPO, Application Record - Broadcasting. Federal Communications Commission. Record Number #26. Form BC-121. Washington, DC. Extracted by Xen Scott. KSPO, Consent to Assignment of Radio Station Construction Permit. Federal Communications Commission. Washington, DC. 28 April 1966. From National Archives, College Park, Maryland. KSPO, Consent to Assignment of Radio Station Construction Permit. Federal Communications Commission. Washington, DC. 22 January 1971. From National Archives, College Park, Maryland. KSPO, Consent to Transfer Control of Corporation Holding Construction Permit or License. Federal Communications Commission. Washington, DC. 29 October 1971. From National Archives, College Park, Maryland. KSPO, Standard Broadcast Station License. Federal Communications Commission. Washington, DC. 19 May 1969. From National Archives, College Park, Maryland. "Manager Joins Radio Station." Spokane Chronicle. Spokane, Washington. 7 February 1972. Page 15. Miller, Earl "Bud." Spokane, Washington. Telephone Interview by Bill Harms. July 2008. "Radio KSPO on 1,000 Watts." Spokesman-Review. Spokane, Washington. 26 September 1965. Page 22. "Radio Station Owner Dies at Age 59." Spokesman-Review. Spokane, Washington. 25 December 1964. Page 6. "Radio Station Sale Planned." Spokane Chronicle. Spokane, Washington. 25 June 1970. Page 3. Read, Tom. Spokane, Washington. Email Correspondence with Bill Harms. September 2008.